Crumble Cottage is based on old-fashioned values, often sadly missing in this frenetic world we live in today. Creative couple Kym and Stephen Yorke left the fast-paced life of international advertising creatives behind, to run their own business from their idyllic cottage in Oxfordshire. The Crumble Cottage range of china, textiles, books, prints, cards and gifts took the Christmas market by storm and already has customers from across the globe clamouring for more. 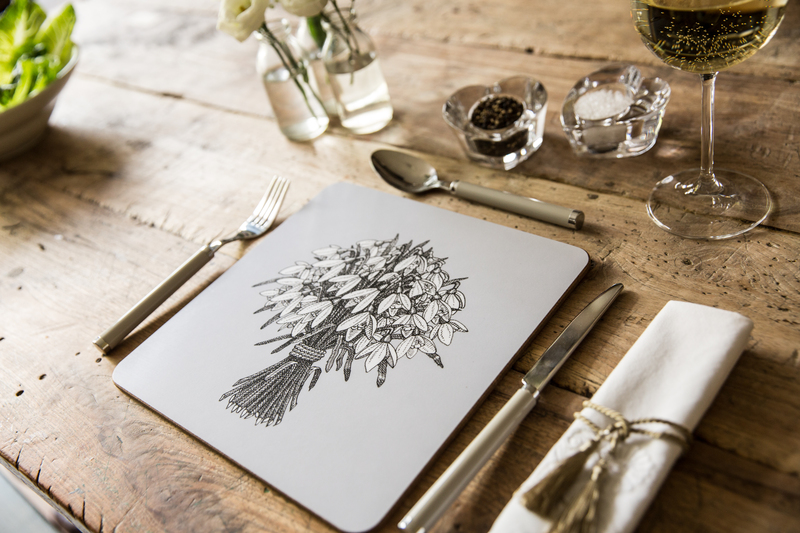 Designed and created in the UK, the range of products includes perfect gifts for Easter, Mother’s Day, Father’s Day, weddings, new baby arrivals, wedding anniversaries and birthdays. The business works with a social enterprise to produce the textiles. The distinctive black and white illustrations capture snowdrops, tulips and roses as well as hearts and the two stars of the Crumble Cottage show-Rosemary and Sedgwick. Rooted in the English countryside, the business is inspired by rural life and a return to simpler times-both in its designs and its ethos and is the culmination of thirty years of illustrations and story-telling. Stephen said: “For almost thirty years I’ve been telling the story of Rosemary and Sedgewick, bakers who live and work in Crumble Cottage, Upper Crustington, Breadfordshire. At first through intricate pen and ink drawings on Christmas cards, but latterly I was inspired to also write my first book, ‘Christmas at Crumble Cottage. “My wife, Kym, and I work closely together to create our range. We’re both art-trained. I gained a place at Moseley School of Art at the tender age of eleven and Kym attended Central St Martins in London, gaining a BA Honours Degree in graphic design. We spent 30 years as advertising creatives before we started Crumble Cottage. “Every item is carefully designed and produced in England and we work closely with small manufacturers across the country, but our most important collaboration is with St Annes Soft Furnishings, a wonderful mental health charity based in Birmingham. They stitch all our jingling bunting, Christmas sacks, cushions and much more. “I still create every image myself, starting with a pencil sketch and then on to the tricky bit, pen and ink. It’s all done by hand and each image takes about two weeks to complete. Kym is still very hands-on too. Her handmade ‘Bunting in a Box’ is one of our most popular products. She is often found in her studio surrounded by thousands of tinkling bells. In Crumble Cottage there is always the smell of freshly baked bread, the fire crackles in the grate and candles flicker on the mantle shelf. Come in to Crumble Cottage, a little piece of England you are sure of a warm welcome. Textiles by St Anne’s, a social enterprise within a leading mental health charity, Better Pathways, are very proud to be manufacturers for Crumble Cottage. Stigma and discrimination surrounding mental health directly impacts on employment possibilities. Since 1963, Better Pathways, has been breaking down these barriers through training, personal development, work experience and support. Not only are the products made in the UK, they also bring social value. Trainees gain valuable work experience in manufacturing techniques enhancing employment opportunities and increasing confidence. For further information, images and samples please contact Stephen and Kym Yorke at 01869 232972. kym@crumblecottage.com. This press release was distributed by ResponseSource Press Release Wire on behalf of Crumble Cottage in the following categories: Home & Garden, Women's Interest & Beauty, Retail & Fashion, for more information visit https://pressreleasewire.responsesource.com/about.